p.132: "[...] Wir haben uns für den Test auf neun Programme mit Spezialfunktionen für Programmierer beschränkt und außerdem auf ein modernes Bedienkonzept Wert gelegt. Emacs und vi müssen also draußen bleiben." p.136, regarding the 70$ editor Sublime Text: "Wer die puristische Oberfläche [...] zum ersten Mal sieht, will seine Texte und Codes künftig mit nichts anderem mehr schreiben. Ein Druck auf F11 aktiviert den Vollbildmodus, und schon ist man völlig allein mit sich und seinem Text. Da gibt es nichts, was den Gedankenfluss stört. Selbst die Maus kann man vom Schreibtisch schubsen, da sich jeder Handgriff konkurrenzlos schnell per Tastenkürzel erledigen lässt." A real hoot, uproariously funny! In future, I can save the money for the Titanic! And what's all this fuss about editors one can switch to full screen mode anyway? Why did we invent the graphical user interface and the desktop metaphor four decades ago? No wonder tablets are so successful. 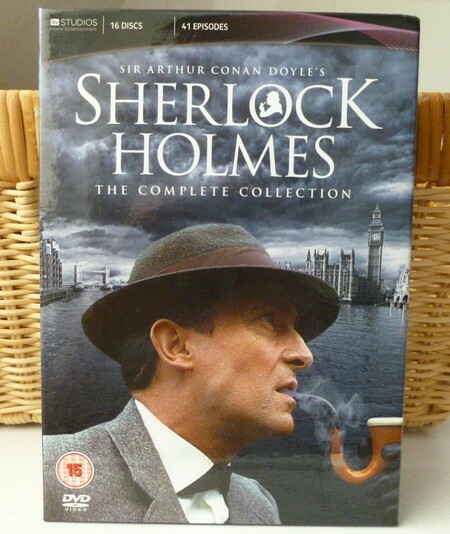 Last December, I looked at my wishlist and decided to get myself a Christmas present: the complete Sherlock Holmes series produced by the British television company Granada TV between 1984 and 1994. This series is scrupulously faithful to Conan Doyle's original and impresses most Holmes aficionados to be absolutely authentic. Jeremy Brett as Sherlock Holmes is viewed by many, including myself, as the definitive interpretation of the Baker street detective, and David Burke as Dr. Watson delivers an equally convincing interpretation of Holmes' obligatory sidekick. Well, at 24th of December the postman arrived with the package from Amazon. He was one of these seasonal workers DHL employs around Christmas, and didn't quite know how to operate the hand-held scanner used to capture shipment information. He nervously fidgeted around with this gadget, and had to try three times to scan the bar-code on the package until he was finally successful. I was mildly surprised when he asked for an identification, and even more so when he started to type my name, address and even the number of my ID card into his scanner. Before I could tell him that I was never asked for any kind of identification when I ordered, the device beeped and he started to sweat. I asked what's the matter, and he turned the display towards me: "verification failed". How is it possible that a verification fails when there's nothing to verify? Well, after some hemming and hawing he finally admitted that he probably mistyped the address, and according to Amazon that's enough to result in this message. I advised him to just start from the beginning and enter everything correctly this time. That, however, turned out to be impossible: once the data are entered into the system, there's no way back. The guy saw my face, panicked and threatened to call the police. Since it was Christmas, I let him live and instead sent a mail to Amazon. Within half an hour, a very polite Indian guy wrote back, offered his most sincere apologies, assured me that he'll send the money back within the hour, and explained that they have to proceed in this way according to the German Jugendschutzgesetz (law for the protection of the youth). And right he is: thanks to Zensursula (beware: explicit visual content! ), all movies without an FSK rating are automatically assumed to be R rated and require an age verification. Note the 15 certificate from the BBFC. This rather high rating is probably related to the explicit display of Holmes' intravenous use of cocaine whenever he's bored. 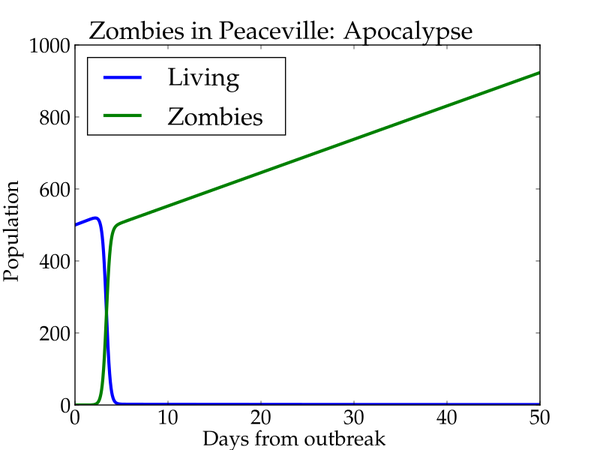 If I have to explain what differential equations are, I always use the zombie apocalypse as an example. 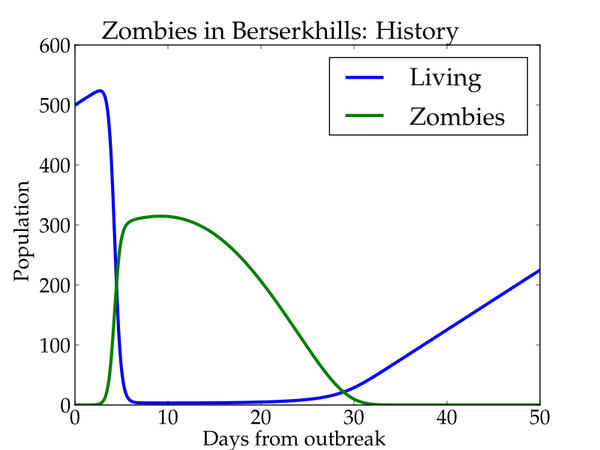 People seem to understand that better than the popular Lotka-Volterra equations modeling predator-prey dynamics, despite the fact that the zombie equations of Munz et al. are much more complicated. Well, to be eaten alive by an undead is just much more scary than being eaten by, say, a lion. Both the Lotka-Volterra and the Munz models constitute a system of nonlinear coupled differential equations for which no analytical solutions exist. We thus have to solve these equations numerically, which is possible, for example, by pylab. What do we learn from that? Even apparently lost fights can be won by determination. I bought my first electronic calculator when I enrolled in physics at the university (they were usually not permitted at school at that time). 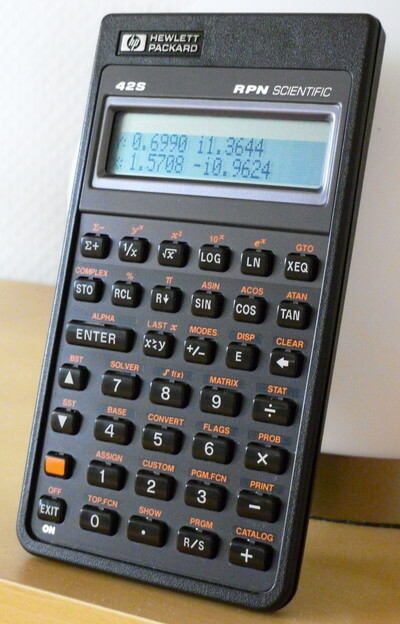 In the late 70s and early 80s, there were only two serious contenders in the calculator market, Hewlett Packard (HP) and Texas Instruments (TI). HP had RPN (reverse Polish notation), TI not. I found the concept fascinating, exhausted all financial resources over which I commanded, and acquired an HP-15c. Since then I'm an all-out RPN advocate. Hell, I can't even use the infix notation anymore. The 15c served me well for many years, but got replaced by a HP-32s when I was working on my PhD. Only a year after, and on another continent, my employer presented me with a HP-42s. Since then (and that's 20 years ago), I use these two calculators day in, day out. Every Unix system comes with an RPN calculator, and an extremely powerful one: dc (part of bc under Linux). to 20 digits. Below is the same calculation with bc. Ignoring the spaces (which are not needed on a calculator), the former requires 19 keystrokes, the latter 30. On a computer, I use the number block on the right of the keyboard to perform such small calculatons. Depending on the distribution, the ',' key may return a comma for a German keyboard layout, but I need a decimal point there as neither bc nor dc recognize numbers such as 15,99.
xmodmap -e "keycode 91 = period period"
Q: Isn't it great that an increasing fraction of young people use Linux on their desktops or notebooks? First of all, they don't use Linux: they use Ubuntu. Exclusively. Not Ku-, not Lu-, not Xubuntu. Uhhhhbuntu. And why? Well, according to my research, because it's different and has a certain coolness factor. It's poor man's Apple, and even the cage looks golden at the first glance. So, second, they use it for all the wrong reasons. Consequently, and thus third, they have no clue of what they are doing, and if an issue cannot be solved by clicking, they are lost. That's neither cool nor great. 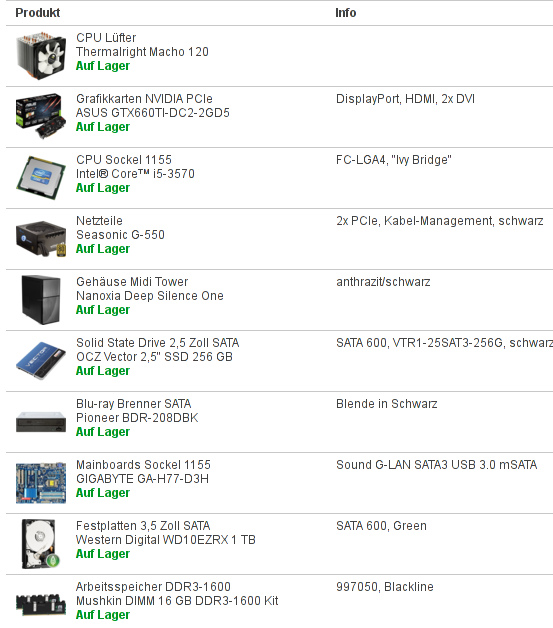 A most amusing example of this particular species of users is Bastian, a 26 years old electrical engineer, member of the Pirate party, owner and avid user of Facebook, Twitter and Google+ accounts and a high-end Sony Vaio with Ubuntu 12.10 (which, I have to admit, was installed by my own stupid self). One can also switch to another console with ctrl-alt-F1 (F2, F3...) and kill the misbehaving program from there. Oh, I forgot: to kill the program, use 'htop' to find your program. Press F9. Try SIGTERM first, then SIGKILL. Or, if you don't have htop, type 'pidof misbehavinprog', and then 'kill -9 pid'. Or 'killall misbehavinprog', that'll also work. And if you can't change to another console, and even your system doesn't seem to respond, there's still the magic sysrequest. Check if it's enabled: 'sysctl -n kernel.sysrq'. If not, issue 'sysctl kernel.sysrq=1'. Don't forget to make this change permanent by editing /etc/sysctl.conf (other distributions may put this switch in /etc/sysctl.d/99-sysctl.conf). The next time your Ubuntu locks up, hold down alt-print and enter reisub. Yes: REISUB. Raising elephants is so utterly boring. Type it slowly so the system has time to do the job you're asking it to do. Bastian told me he can't possibly remember that, and asked if there isn't an app for it. I've mentioned Acrylamid in my last entry. Today, I thought to have a closer look. But there are so many things I've never heard of. I know of pip and gem. But what are jinja2 and mako? What are sass and compass? What is virtualenv? I know markdown, but what is textile or sphinx? It's like meeting Pandora Junior, and opening her box unsuspectingly. Here are the commands you need to temporarily setup the blog of Mark van Lent including all dependencies. What's definitely required is an installation of python and ruby, including their package managers pip and gem. $ gem install sass --version="3.2.1"
$ gem install compass --version="0.13.alpha.0"
$ vim conf.py           %change your name etc. It's significantly easier without the virtual environment, which, however, enables you to work on setups with very different requirements. That's, by the way, an excellent example of the minimalistic style which is currently en vogue. It has advantages: as you see, it looks clean and clear. 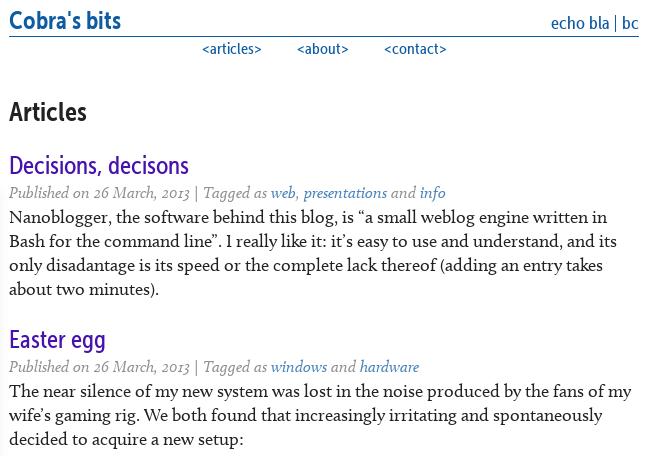 An even better example is the blog of the acrylamid author himself. He's an Apple user, so the design is dramatically minimalistic and is dramatically lacking the most useful functions. For example, while I'm not insisting on a tag cloud, it is very useful to have lists sorting entries according to time or tags. And where's a search? Without a search, a blog is just a pile of junk: you never know what's hidden underneath, but you ain't got the time searching anyway. Very similar to mine in many respects, though not a single part is identical (since Alternate made a mistake and delivered the system in the black Nanoxia case, instead of the anthracite one we had ordered, they actually look like twins). It's more tweaked towards games, of course, but even under full load it's just as silent as mine. Chapeaux, Asus! We've briefly considered to order this system with Windows 8, but after some tests in a virtual machine my wife's verdict was clear: Windows 7 will do just fine. Perhaps next time, Microsoft! ;) We've used Ninite to speed up the initial installation process. Still, compared to the installation of a modern Linux distribution, the setup of Windows feels hopelessly antiquated.